by acclaimed playwright Peter Quilter. 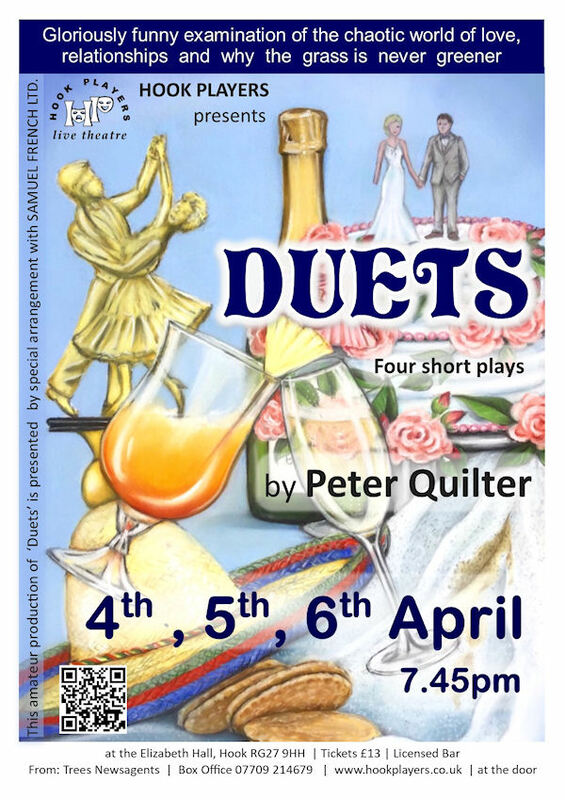 Performances will be on 4th, 5th and 6th of April. See our “Next Production” page for more information. We are actively seeking plays for future productions and holding play readings, where members read through possible scripts. If you are interested in attending, please send your details via ku.oc1555994170.srey1555994170alpko1555994170oh@su1555994170tcatn1555994170oc1555994170 for more information. These play readings are very informal and you don’t have to read if you don’t want to. It’s a great initial introduction to Hook Players and is a good opportunity to meet the group. It’s not all about being on the stage. So much goes on backstage including set design, painting and building, making costumes (you don’t have to be a great seamstress to be able to help), make-up, doing the technical stuff (sound, lighting and special effects), gathering props or simply helping with the front-of-house on performance nights,. If you are interested, please email ku.oc1555994170.srey1555994170alpko1555994170oh@su1555994170tcatn1555994170oc1555994170. There is something for everyone. If you can’t get involved this time, then please buy a ticket, sit back and enjoy the show.